Citation Information: J Clin Invest. 2016;126(4):1163-1172. https://doi.org/10.1172/JCI81130. EVs from cancer cells manipulate the cells in their microenvironment. EVs are involved in every step of cancer development. 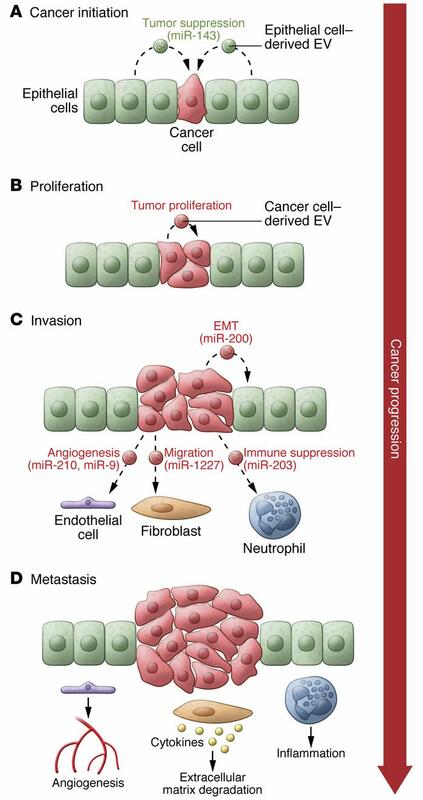 During cancer initiation (A), normal cells (epithelial cells) attempt to prevent the outgrowth of precancerous cells (or cancer cells) by secreting antiproliferative miRNAs through EVs; however, the cancer cells can circumvent this inhibitory machinery, finally resulting in tumor expansion (B). Cancer cells utilize EVs to mediate horizontal transfer of genes that promote proliferation to cancer cells that do not harbor those genes (B). Cancer cell–derived EVs promote cancer malignancy (i.e., the induction of inflammation by infiltrating neutrophils) (C and D). Additionally, cancer cell–derived EVs activate fibroblasts, leading to extracellular matrix degradation and the induction of cancer-promoting cytokines (C and D). When the tumor microenvironment is hypoxic, cancer cells secrete angiogenesis-inducing EVs that help to overcome oxygen and nutrition deficiency by activating endothelial cells to stimulate vascularization (C and D), contributing to further cancer development, such as metastasis (D).